Shilpa Shetty's son is winning the Thursday mood without a throwback picture. 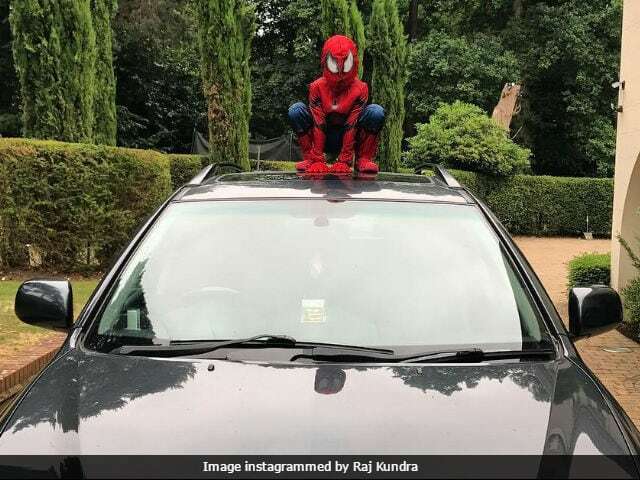 Shilpa re-posted a picture (originally shared by her husband Raj Kundra) of her five-year-old son, dressed in a Spider-Man costume, posing atop a swanky Lexus. She wrote in caption: "Spider-Boy Homecoming awwwww look at him posing (sic)." PS: The Lexus Viaan used as a prop belongs to his grandmother (Thanks, Raj Kundra for the information). Viaan's cute and mischievous picture has over 20,000 likes. Shilpa is currently on a vacation with her family in London (on her list of frequently travelled places) after she attended the IIFA awards a few days ago. When in London, Shilpa and Raj caught up with Tennis ace Sania Mirza. Shilpa Shetty and Raj Kundra attended the IIFA awards in New York over the weekend. They walked the green carpet in style - Shilpa dressed in a fabulous risque dress by Monisha Jaising. Shilpa Shetty debuted in Bollywood in 1993 opposite Shah Rukh Khan in Baazigar, co-starring Kajol. She is known for her role in films like Dhadkan, Pardesi Babu, Phir Milenge, Garv: Pride and Honour, Dus and Life in a... Metro. She's also quite popular for her special song appearances in Shool's UP Bihar Lootne and Dostana's Shut Up & Bounce. In 2014, Shilpa Shetty produced her first film Dishkiyaoon, staring Harman baweja and Sunny Deol. Shilpa Shetty is a self-confessed fitness enthusiast and has written several books on yoga and diet. Shilpa also has a range of yoga fitness videos. Shilpa Shetty married Mumbai-based businessman Raj Kundra in 2009 and the couple welcomed Viaan in 2012.